VAIL, Colorado – The town of Vail’s Billion Dollar Renewal has meant that construction sites visible within the town have been as common as wildlife sightings and panoramic mountain views. Many large projects are wrapping up construction this fall as more projects such as the West Vail Fire Station and Lionshead Transit Center are beginning construction. There might not be as many cranes in Vail as there were a year ago, but there’s still plenty of construction activity happening in town. The Solaris project in Vail Village has opened up piece by piece, as various retailers have begun opening their doors for business within the last month. Residents have also begun moving into condominiums at the building, although there are still many units for sale and several retail spaces still wrapping up construction. The Asian fusion restaurant opening in the large restaurant space above the retail shops is scheduled to open sometime in December. The owners of the restaurant are moving to Vail this month to prepare the space for the opening. The final public art piece is scheduled to be installed toward the end of August, said Leonard Sandoval, the town of Vail’s construction coordinator. It’s a large art piece coming out of California, and will require a crane to install it, he said. Landscaping is ongoing, and there will also be some activity on the Frontage Road in front of Solaris after Labor Day – crews will be constructing a center island on the Frontage Road. Some of the landscaping activity will require lane closures, Sandoval said. First Chair is Vail Resorts’ employee housing project, located at the southern end of the pedestrian overpass, on the corner of West Lionshead Circle and South Frontage Road. Construction began on the four-story building in April. 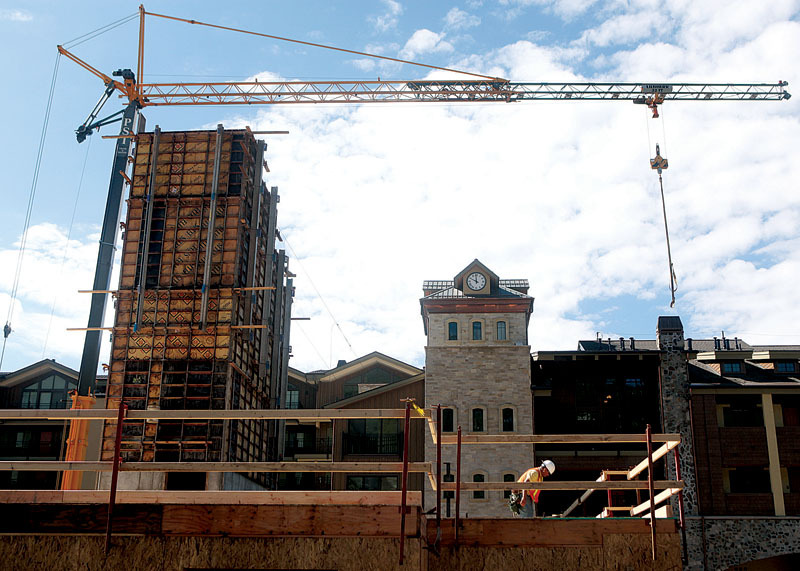 The project will include 124 beds of employee housing in three- and four-bedroom units. The building will have parking, skier drop-off spaces, and new snow-melted pedestrian walkways along the south and east sides of the project. First Chair is scheduled to open sometime in 2011. There will be some utility work on West Lionshead Circle coming up this fall, meaning traffic in that area will be somewhat disrupted during that time, Sandoval said. The Four Seasons project in Vail, on the southwest corner of the main Vail roundabout, has had some bumps in the road in recent months. The bank, Barclays Capital, had to take ownership over the property because of the developer’s financial problems. There was a change in general contractors after the transfer of ownership, causing the construction timeline to slow down a bit, said a person close to the project who spoke on the condition of anonymity. Construction has continued, however, and a new completion date should be announced within the month. Sandoval said the Four Seasons is “pretty much complete” from the town’s standpoint, but that more work remains inside. Some sidewalk repairs along the Frontage Road also need to be finished, he said. “I’ve heard they want to open by December, and I’ve also heard sooner than that,” Sandoval said. Construction at the Ritz-Carlton Residences in West Lionshead is expected to be finished this fall and as early as this month. Once construction ends, there will be several rounds of inspections by the Ritz-Carlton, the town of Vail and Vail Resorts Development Company. Residents could start moving into the property around September or October. Forty-eight of the 71 wholly owner units at the Residences are currently under contract. Vail Resorts Chief Executive Officer Rob Katz said in the company’s third quarter earnings call that he expects more closings to start happening once construction is finished. Vail Resorts’ $1 billion proposed Ever Vail project is still in review with the town’s Planning and Environmental Commission. The project, which would add a parking structure, gondola, retails shops, commercial space, condominiums, a hotel and a new facility for mountain operations, would be built west of Lionshead and west of the new Ritz-Carlton Residences. The first phase of the Lionshead Transit Center project is scheduled to begin Monday. The $4.4 million phase will include a new 1,200 square-foot transit building with a waiting area and restrooms, four ECO Transit bus bays, Frontage Road improvements and 20-space passenger drop-off area on the lowest level of the Lionshead parking structure, just off East Lionshead Circle on the west side of the structure. Over the next few months, crews will be working on bringing the building and structure out of the ground, including foundation and structural work, followed by exterior walls and roofing, to get the building enclosed to continue interior construction throughout the winter, according to Adam Williams, of ARC Integrated Program Management. Sitework will be ongoing, including installing the face to the retaining walls, installing new drive entrances, completing site utility work and some coordination of installing a new storm drain across the Frontage Road, as well as final grading and paving on site, Williams said. The Rams-Horn Lodge Condominiums project will include installation of a couple of crosswalks on Vail Valley Drive, as well as the relocation of the sidewalk to allow for a wider road to accommodate town buses. The town of Vail bought Timber Ridge for $20 million in 2003 to preserve the property’s deed-restricted employee housing designation, and also with the intention of getting the property redeveloped. The town established the Timber Ridge Affordable Housing Corporation to operate and manage the property. Negotiations with a Texas-based development firm began last year to redevelop the eastern portion of the 10-acre property into 360 employee housing units, a five-story parking garage, clubhouse and fitness center. The cost of the eastern half’s redevelopment is about $60 million. The redevelopment of the eastern half of Timber Ridge got approval from the town’s Design Review Board earlier this week. The developer still needs to enter into several agreements with the town, which would be done through Town Council votes. The town’s review process has taken longer than developer Darren Woody expected, but he thinks construction could begin by the spring of 2011. The first phase of construction includes demolishing the existing eastern half of the Timber Ridge site. The demolition, combined with construction of the new building, will take about two years. Vail Resorts has already removed the old High Noon Express lift from Vail Mountain and sold it to the Whitewater Ski Resort in Nelson, British Columbia. The old chair was a fixed-grip, three-seat chair – it’s replacement is a high-speed quad that will speed up traffic out of the Sun Up and Sun Down from 11 minutes to six minutes, nearly doubling the capacity from 1,400 people per hour to 2,400. Helicopters are scheduled to deliver the new chairlift in pieces sometime in mid-August.